Let your dear ones feel the real essence of Raksha Bandhan when you order online for them this Classic Rakshabandhan Homemade Chocolates with Om Rakhi complemented with your best wishes and prayers for them. This Gift includes Assorted 27 pcs Homemade Chocolates with 1 Om Rakhi. 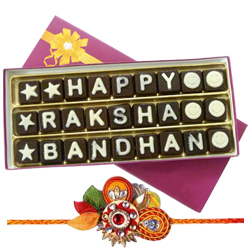 Celebrate Rakshabandhan by delivering this Rakshabandhan Pack of Assorted Homemade Chocolates (27 pcs) with 2 Om Rakhi. Celebrate Rakshabandhan by delivering this Rakshabandhan Pack of Assorted Homemade Chocolates (27 pcs) with 3 Om Rakhi. Celebrate Rakshabandhan by delivering this Rakshabandhan Pack of Assorted Homemade Chocolates (27 pcs) with 4 Om Rakhi. Celebrate Rakshabandhan by delivering this Rakshabandhan Pack of Assorted Homemade Chocolates (27 pcs) with 5 Om Rakhi. Celebrate Rakshabandhan by delivering this Rakshabandhan Pack of Assorted Homemade Chocolates (27 pcs) with 6 Om Rakhi.